While I want my students to leave my class able to confidently write in an array of genres, I also want them to have opportunities to chase their own ideas and see where they take them without the restriction of a prescribed genre study. After all, this is how real writers write. Rarely does a writer sit down to say, “I want to write an editorial.” Instead, a writer feels impassioned about an issue they want to see changed. She thinks, “How can I best share my view of this problem and my solution?”. She writes an editorial. A writer remembers a treasured moment in his childhood — sneaking into his parents’ room to watch movies with them after his siblings went to bed. How can he best share this memory? He writes a narrative scene. And perhaps he connects that scene to other important childhood scenes, linking these images together into a memoir. I want my students to write like real writers. I want them to be inspired by their ideas first and then find the perfect form for them. I borrow from Nancie Atwell’s writing territories and call these pieces “territory writing”. I begin a territory writing unit with a whole day of gathering, generating, curating, and talking-out of ideas. My students are rarely ready to go with a topic in hand. They need time to cull through their writer’s notebooks, borrow ideas from others, and bounce ideas off of their writing group. I assign small groups of students one of the four mentor texts and ask them to identify if they have the narrative, the editorial, the critical review, or the This I Believe essay (these are the four genres we have studied so far this year). The groups work to annotate their assigned text for key identifying features of that genre. While they already have these in their writer’s notebooks, I want to jog their memories! And I want them to be specific about the text features that separate one genre from the next. After we have shared these, and students have labeled each mentor text with the correct genre, I remind students that every writer has a purpose and an audience in mind. With their groups, I ask them to go back through, quickly read each mentor, and determine the author’s purpose and the author’s audience. We share these with the whole class. I remind students that writing starts with an idea. They started to pinpoint that idea in the previous day of writing workshop. They now need to pick a genre — a form for that idea. And that form will depend on their purpose and their audience. If they want to inform school administration about their plans for a healthier lunch program, they should probably steer toward editorial. If they want to remember their amazing grandmother, they might consider narrative. Or if they want to zoom in on an important lesson their grandmother taught them, they might choose a This I Believe essay. Students are now ready to begin selecting the right genre to fit their idea. Any one of these could serve as a mentor text in a particular genre by itself! I will be returning to these mentor texts throughout the territory writing unit as I focus my students on the technique of using evidence to support the purpose of the work. How do you direct your students to find the right genre for their ideas? Do you have clusters of mentor texts that you use together? 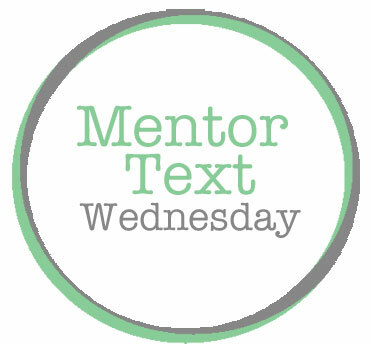 What would you like to see featured on Mentor Text Wednesday? Leave us a comment here or find us on Twitter @rebekahodell1 and @allisonmarchett.